Wisconsin has more than 190 cities, 400 villages, 1,000+ towns, and 1,000+ unincorporated places. Learn how to pronounce them all! More than 5.7 million Wisconsinites live in this Great Lakes state known as America's Dairyland. 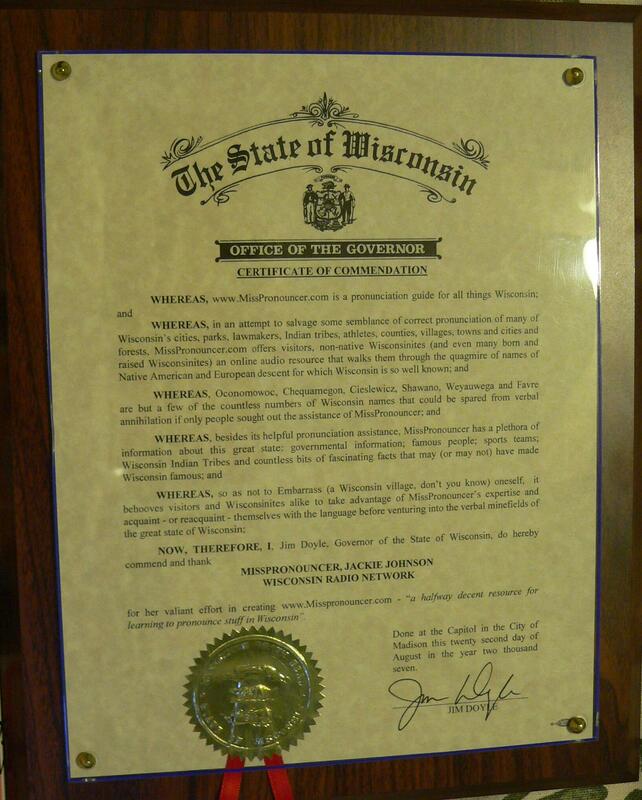 Wisconsin -- also called the Badger State -- became the 30th state of the union in 1848. MissPronouncer is pronounced #1 by the governor! Along with locations, you can hear how to pronounce names of Wisconsin lawmakers, famous people with ties to our fine state, and miscellaneous folks. Minnesota is the land of 10,000 lakes; but, did you know Wisconsin has over 15,000 lakes, 33,000 miles of rivers and streams, and is bordered by two Great Lakes and the Mississippi River?